The Calhoun Yellow Jackets had been here before, final game of the season and playing for a state championship, against the Buford Wolves. After a scoreless fourth quarter, Buford scored first on a 33 yard field goal. Calhoun came right back with a field goal of their own and it was ties 3-3. Buford was blitzing from the outside so Calhoun made then pay on a Taylor Lamb screen pass to Darius Washington that went 63 yards for the touchdown and a 10-3 Calhoun lead. Buford would answer right back as CJ Moore , who had taken back kickoffs for touchdowns this season, sprinted around the right edge 68 yards for a touchdown and a 10-10 score that would go that way into halftime. After the break Calhoun woke up after the teams traded punts and Lamb went 15 yards for a touchdown and added the two-point conversation giving the Yellow Jackets an 18-10 lead and the momentum. In the fourth quarter Calhoun would add two field goals and lead 24-10 with a little under 3 minutes to play. That’s when the fun started. After getting a break to bring back an interception, Sam Clay went to the right corner for Paris Head for a touchdown that would keep the Wolves chances alive trailing 24-17. The onside kick was recovered by Calhoun, however Buford had all 3 timeouts. The Wolves would force Calhoun to punt. The snap was low, the punt was blocked and Dillon Lee scooped it up and raced for a touchdown after all of a sudden it was 24-24 overtime was on the horizon. In overtime Buford’s Andre Johnson would fumble-Buford’s fourth turnover of the game- on the first play and Calhoun pounced on it. The Yellow Jackets wasted no time lining up for a field goal on first down and Austin Griffith would nail it giving Calhoun their first state Championship since the year 19 and 53, ending Buford’s four year run and leaving the Wolves in massive tears afterwards. Calhoun finished ranked No. 57 in the Rivals High Top 100 and Buford, who was as high as No. 9 finished at No.60. Calhoun is better than 57 and Buford is better than 60 in our eyes here at Total Sports Coverage, but feel they are where they are after you consider ALL things. Lovejoy’s defense has been a force all season allowing only 3.6 ppg entering the contest as has Tickers rushing offense. 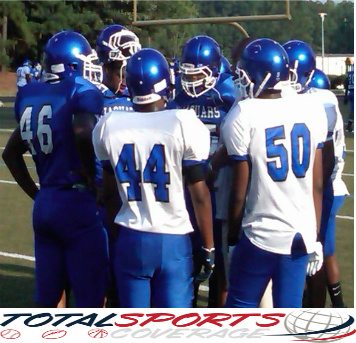 The Wildcats defense would face a stern machine in an offense in the Tucker Tigers who came in averaging 35.3 ppg. In other word you know something would have to give. Tucker’s Jordan Landry scored on a touchdown run and it was 6-0 after a failed 2pt-conversion, something Tucker has used at will this season and early in ballgames like this attempt. Lovejoy just could not get anything going. In the second frame Tucker would record a safety after Lovejoy would start inside their own 5-yard line after fielding a punt there. That would result in a Tiger safety making it 8-0. Yusef Minor would stretch the Tiger lead to 15-0 on a touchdown run and a halftime lead of 15-0. In the third Tucker would go right back to work pushing thier lead to 22-0 on a touchdown run from Dallas Rivers. RIvers did not play nor had a carry in the first half but had two back-to-back carries on this drive with e last resulting in the touchdown. Lovejoy would not die however as they put together a drive in the fourth quarter ending with a Alejandro Bennefield to Arshard Jackson touchdown pass in the right corner for the final margin of 22-7. The 22 points would be the most that Lovejoy would allow in 2011. Tri-Cities scored 20 on them earlier this season and Tri-Cities went out in the quarterfinals with a loss to Northside-Warner Robins who would fall to Tucker the next week. Tucker’s Head Coach Franklin Stephens won his second state title since being the sideline boss at Tucker with the other coming in 2008 against county rival and private school Marist. Tucker finished the season undefeated at 15-0 and as the 26th ranked team in the Rivals High Top 100. Lovejoy did not make the Top 100 but has nothing to hold their head downs about. 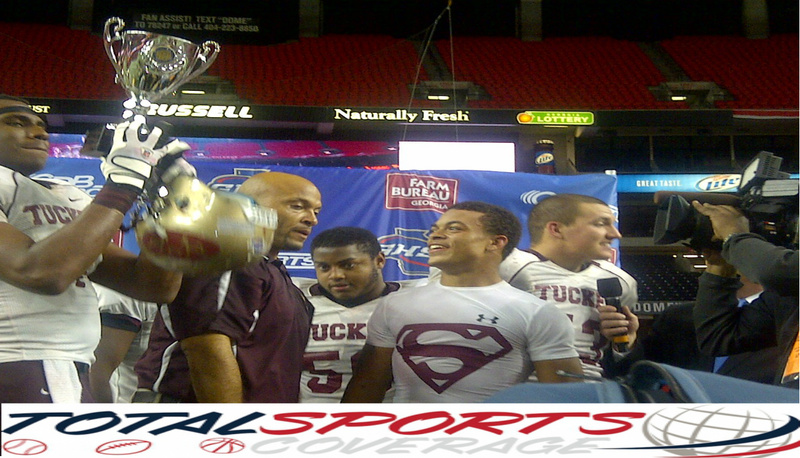 We at Total Sports coverage feel Tucker is a Top 15 team/program in the nation, but what do we know? Then there were 10, 2 in each classification set to square off for the State Title. Grayson entered their semifinal tilt with Colquitt seeking revenge and got it started early going 12 plays and 77 yards capping it with a Jordan Germany touchdown run and a 7-0 lead. Robert Nkemdiche carried the load with 45 yards rushing on that drive while Germany had 28 yards rushing on the drive. Colquitt would come right back on their first drive to tie it on touchdown run by Shermaine Washington capping a 11-play 80 yard drive evening the count at 7. Devin Gillespie, who was unused on the Rams first possession, got in to the act in a big way taking the first play from scrimmage after the Colquitt score 78 yards to the house for a 14-7 Grayson Ram lead. Then the Grayson defense rose to the occasion stopping Colquitt on a fourth down which setup a Nick Schuessler to Austin Meadows 44 yards touchdown pass to give Grayson a “comfy” 21-7 lead with 11:08 left in the second quarter. Colquitt would fumble the ensuing kickoff on a forceful hit by Jordan Germany, but would be unable to turn it into points after passing on a field goal attempt and failing on the fourth down attempt. Colquitt would then put together another long scoring drive against a Grayson defense, one that has not yielded many of those all season. The Packers of Moultrie went 11 plays and 79 yards as Willie Woodyard finished it off with a 15-yard touchdown run pulling the “Pack Attack” to within 7 at 21-14. That score would hold into halftime. Grayson, if you remember, scored on their opening possession of the game and that formula worked on their opening possession of the second half after forcing Colquitt to punt. Robert Nkemdiche found the end zone from 1 yard out with a little less than 8 minutes to play in the third quarter for a 28-14 Grayson Ram lead. As was the case to open the game, Colquitt would answer on it’s next possession. Colquitt quarterback, Cole Seagraves would hit Ty Flournoy-Smith (27 yards) and Bobby Hill on big passing plays, Hill for 33 yards down to the Grayson one yard line, with Shermain Washington finishing it off with a one-yard touchdown run and a new scoreboard with bulbs showing 28-21 favoring Grayson. Grayson, who had passes twice earlier on field goal attempts in the game, would miss mid left on their only attempt on the ensuing possession. Colquitt would cash it in on Willie Woodyard’s second touchdown run of the game on the first play of the fourth quarter knotting score at 28 tight. Back to back 30 yard passes from Seagraves to Ty Flournoy-Smith and Tre Cooper set up the score from Woodyard. The tension and drama would heighten from there. Grayson again facing a fourth down, this time on their own 39, would go for it and fail. Colquitt was held in check by the Grayson defense and had to settle for a 45-yard field goal by Oscar Luna to give the “Pack Attack” their first lead of the game at 31-28 and the folks from Moultrie, GA were rocking their side of Grayson Community Stadium with 7:17 left in the final frame. It was now time for Grayson to come from behind if they wanted to win, a position they aren’t too familiar being in this season. Facing a key fourth and three they went to the air and got a pass interference call and new life. Then facing a third down and eight Grayson went to the air again and Colquitt was hit with pass interference again, again a late flag and again upsetting the Moultrie following. Grayson would stay composed as Schuessler would find his longtime teammate and friend Marcus Lindquist from 6-yards out giving the Rams a 35-31 lead with 28 .7 seconds left in the contest. 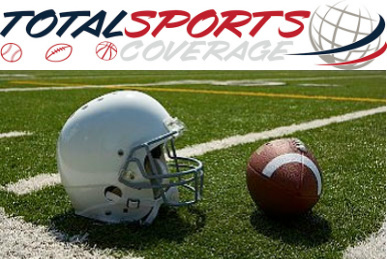 Colquitt had no magic left from Kingsland, Ga when they topped Camden County on a last minute drive and two-point conversion to advance to the semifinals. “We knew what we had to do… we had to be ready to make the play and execute it”, Grayson QB Nick Schuessler said afterwards. He continued. “Were always gonna have haters out there… as long as were winning doesn’t matter if we run, pass whatever”, in response to some of the “flaws” that many see in the Grayson Ram offense. And how about that last TD pass, which was his second of the night? “At first I didn’t like the call, I’ll be honest with you. Me and Marcus have such good chemistry, I’ve been playing with him for so long, that’s one of my best friends, he was covered at first and then he broke off his route and he made a heck of a catch and my line gave me the best protection”, Schuessler stated. The wins give Grayson (14-0) their first appearance in the state championship game in the programs history. For Colquitt their season is complete with an 11-3 record and Head Coach Rush Propst standing in the middle of the field around the fifteen yard line watching in frustration as Grayson students and fans rushed (no pun intended) Britt-Moody Field in celebration. Grayson will face nationally ranked Walton who hung on to defeat a game Lassiter squad 30-24. Walton’s standout running back and former Lassiter Trojan Tyren Jones rushed for two touchdowns (13 and 65 yards) while teammateParker McLeod scored on the ground and tossed a 79-yard touchdown pass to Dakota Washington. Lassiter Eddie Printz tossed the ball around the yard 57 times finishing just shy of 400 yards with 396 with 34 completions and two touchdowns. Isiah Willis added a touchdown on the ground for a Lassiter team that found itself nationally ranked for the first time this season going in the game. In the 4A: The Tucker Tigers (14-0) defeated Northside-Warner Robins (13-1) 17-16 on the road to clinch their berth in the 4A state title game. Tucker and Northside-Warner Robins entered the game ranked in the national polls with a 22 spot separation in one. Tuckers’ Jordan Landry would fall just shy of 100 yards rushing with 96, including a 31-yard touchdown run. However he was upstaged by the Tucker defense. Northside-Warner-Robins was was sitting on the door step ready to cash the ticket to the Dome when their hopes were done in. They fumbled into the end zone and Tucker’s Justin Rivers picked it up and went 105 yards for the Tiger touchdown. Tuckers defense would hold in the final 5 minutes of the contest to advance. Tucker will face 14-0 Lovejoy who got by Warner Robins 21-6 and held the Demons without a touchdown. The Lovejoy defense has been sick all season entering the game with 8 shotouts in the previous 13 games. Tonight was no different. Warner Robins did not help themselves either with mistakes. The Demons had a first punt blocked, missed a 32-yard field goal, committed a costly holding penalty in a first and goal situation, lost a fumble, missed passes that could have been big play touchdowns during the course of the contest. After a scoreless first quarter the Wildcats would but up a 7 spot in each of the final quarters. Alejandro Benefield would connect with AJ Jackson twice for touchdowns, both off of Warner Robins interceptions and Travis Custis added a 27-yard touchdown in the fourth to seal the deal on sending Lovejoy to their first state title game appearance. In 3A… Burke County blasted Gainesville 63-28 and Peach got by Cairo 16-7. In 2A… a rematch of Buford and Carver-Columbus was in order. for the teams third meeting in two seasons. Dontravious Wilson provided the first points for the Wolves on at touchdown run. Torrance McGee hit Darius Williams on a 68-yard pass setting up McHee touchdown run to even the score at 7 all. Carver-Columbus would recover a Buford fumble and turn it into points on a Noah Hickey touchdown run and a 13-7 Carver lead at the half. The last time Buford trailed in a football game was against Carver-Columbus in September of 2010 when they lost 14-0 at the same stadium in . After halftime, Buford would never look back scoring 21 unanswered points on Sam Clay, Nathan Staub and Rick LeGrant second half touchdowns. Buford has been ranked high in the national polls since late August. The Wolves will face a familiar foe in Calhoun. Calhoun defeated Appling County going away 51-14 to advance. The two programs will be meeting for the fourth consecutive year in the 2A state title game with Buford winning the previous 3. 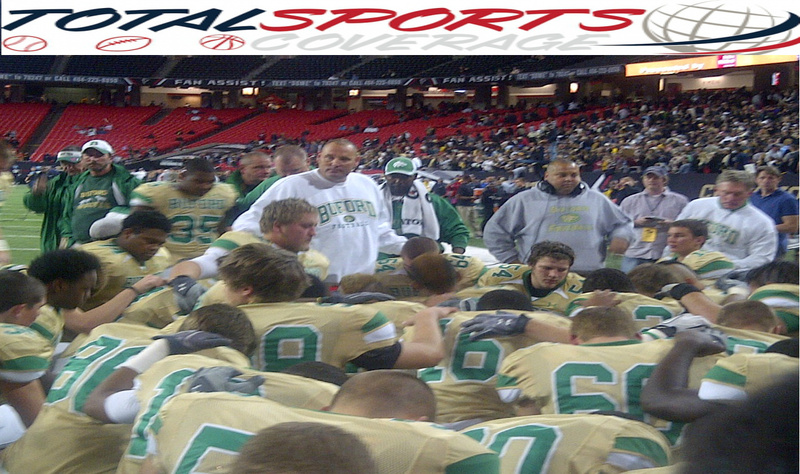 Buford is seeking a state record fifth consecutive state title. In 1A… Savannah Christian ended Prince Ave Christian’s quiet run for a title defeating them 27-0. Prince Avenue was the only team to be held scoreless of all semifinal teams in all classifications. Landmark Christian defeated Eagles Landing Christian 14-7 to advance to play Savannah Christian. The State Championships will be held next weekend December 9th (2A and 4A games in that order) and 10th (1A, 3A and 5A games in that order) at the Georgia Dome. Then there were 20…yes 4 in each classification that will do battle to earn a right for a berth to play for a state championship, the ultimate goal of every team when preseason practice tees off in early August. 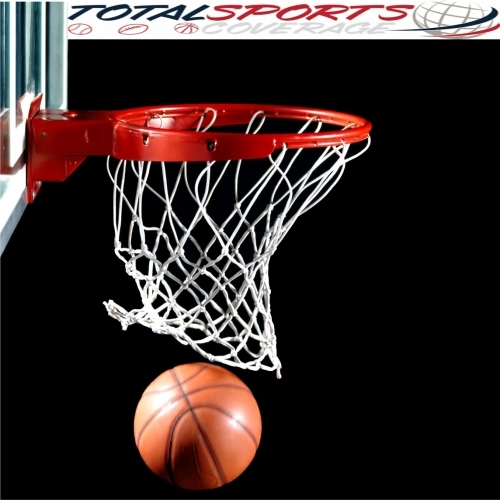 Do all remaining 20 make the Total Sports Coverage All Classification Top 10? No. Winning, strength of schedule, out of state foes, in state foes of quality, region balance, overall team performance, coaching, community/booster involvement, emotion, program (history AND current growth), logistics, can you win against the other “big boys” and season end result all factor into how well a high school football team performs during the course of a season. In other words you would have no major issue sending your child to one of these schools. All of those encompass these “rankings”. After all were talking about 14 to 18 year-olds who will mold society in the very near future. Not ony that you won and/or are winning but HOW you won. You could have won an emotional game against a well respected team/program by making a bold call at a key situation,having a top-tier player making a play. That call was successful, does it mean your better than that team, logic says yes but logic also factors other key elements. 4.Tucker Tigers (13-0) All region schedule so they could not schedule out of state/heavy state programs, tied Stephenson in scrimmage, Region (6-4A) is not as strong as appears but team is better than the region. 5. Walton Raiders (13-0) subpar Region (5-5A), wins over current semifinalist Lassiter and Reg 7 (Peachtree Ridge) and Reg8 (Dacula-in playoffs), dynamic running back leading the way. Easiest draw in 5A playoffs. 8. ML King Lions(12-1) Wins over Reg 7 (Collins Hill), 2 wins over Reg 8 (Brookwood [defending state champs], South Gwinnett, Reg 1 (Valdosta, Coffee Co.) and Reg2 (Stephenson). Won second straight Reg2 Title. 6-1 against playoff teams in 2011. 10. Northside-Warner Robins (13-0) In the 4A State Semifinals, 5A Finalist in 2009 lost to Camden County. Other Solid Teams of Note (OSTN)…The other 15 that Total Sports Coverage would lineup against anybody, IN NO ORDER. Calhoun (2A State runner-up 3 years running, all losses to Buford/program), Stephenson (talent/program), North Gwinnett (program/coaching), Ware County (program), Lovejoy (growth of program and overall body of work), Dublin (overall body of work), Elbert County (overall body of work/coaching), Wilcox (program, overall body of work), Flowery Branch (program/logistics, overall body of work, all region schedule with “clause”), East Paulding (overall body of work), Lincoln County (logistics/program, overall body of work), Clarke Central (program, recent growth/rebirth of program, logistics are major downfall), McEachern (program) Hillgrove (growth of program) and Warner Robins (program, recent growth of program) . There you have it the All-Classification Top 10 and then 15 that would make up a Top 25 in Georgia but there is no such. Every team in the “top 25” could hold their weight even in a loss against any other team in the country regardless (even if they get blowed out). Notice there are no private schools, and yes there is a sound reason to that. All the private schools fall in 1A and have not done the work of the 1A schools listed (Lincoln County and Wilcox plus those not listed in Charlton and Clinch Counties) and YES logistics play into that because it is a reality. Prince Avenue Christian, Landmark Christian, Eagles Landing, Savannah Christian and Wesleyan are doing work but would they in 2A and above, NO. Marist was considered and respected but overall not a “Top 25” team in Georgia with there overall body of work. So why Tucker and Flowery Branch (same class as Marist)…weak Region showing in playoffs hurts overall body of work for Marist. Tucker could pull weight in 5A and be a quarterfinalist as would Northside-Warner Robins. An exact science it is NOT,however all facets count to logic. 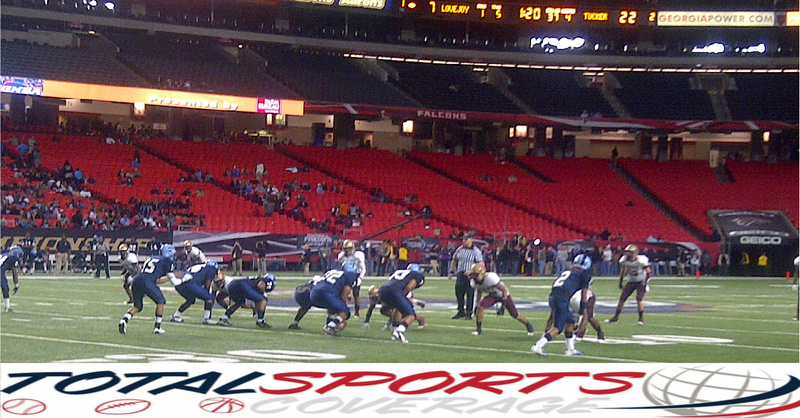 CLARKSTON, Ga – Brookwood came in with a vicious rushing game led by Nick Tompkins and Jamaal Cole. ML King came in with a fierce passing game triggered by veteran signal caller Jonquel Dawson. That left both defenses on the hook to stop what was thrown at them, no pun intended. In the end it was the ML King passing game and defense that would power them to a 27-21 overtime victory to advance in the Georgia 5A state playoffs. The first three quarters were good football but didn’t feature much scoring and then BOOM the fourth came and the defenses, along with the offense were on full display. Jamaal Cole scored on a 7-yard touchdown run on the games opening drive for the Broncos and Jonquel Dawson found Josh Stanford for a 36-yard touchdown pass midway through the third quarter for the Lions. Each team turned the ball over, Brookwood with a fumble and ML King with 2 INT and a fumble plus missing two field goals (one blocked) through 3 quarters. So we enter the fourth frame tied at 7. “Our kids just fought, they never gave up. There was never a situation in the game where they felt like they couldn’t win the game” ML King head Coach Michael Carson said. Brookwood would put themselves in fine postion when Zach Moon hit BJ Sammons for a 49-yard pass play to the ML King three. Four plays later on fourth down Jamaal Cole scored his second touchdown of the game, this one from 1-yard out to give the Broncos a short lived 14-7 advantage. Short lived because Jonquel Dawson would hit Josh Stanford on a 61-yard screen play to the Brookwood seven and Jeremy Tyler ran it in from there and it was tied at 14 forty-four seconds after Brookwood went on top. So the fourth quarter “shootout” was on. Brookwood faced a fourth down and Josh Brown pickup 27 yards on a fake punt that would lead to a Nick Tompkins 2-yard touchdown run putting Brookwood back on top 21-14 with 2:53 left in the fourth and the Broncos and their faithful were feeling pretty good. However Dawson and the Lions would fight back with it’s offense and defense. After hitting Tibbs for 27 yards and Stanford for 21 yards , Brookwood’s Josh Brown stepped up again intercepting Dawson and all but sealing the Broncos win with 1:59 remaining, you thought. Brookwood was out of timeouts and ML King had all three of theirs. Brookwood went three-and-out but more importantly ran out of bounds on second down preserving ML King of a timeout. Facing a fourth down backed up, Brookwood utilized the “rugby” style punt that has been sweeping the nation (and could have easily ran for the first down) booting it 55 yards to the ML King 28 with 1:27 remaining, putting up the Lions in the ultimate “win or go home” situation. King ran a double pass (in the stat book it goes for a run as they were laterals) with Jeremy Tyler picking up 20 yards and getting out of bounds. Then on fourth down Dawson hit Tibbs for nine yards. Then Dawson, on second down and one with only nine seconds left, found a wide open Cornell Boyd for a 32 yard touchdown pass down the left side with no time remaining, a good extra point made it 21 even and overtime would be a reality. On the first play of overtime (after a false start penalty) Dawson went to the right corner for Blake Tibbs on, what coach Michael Carson said was a “sluggo” route for a 20-yard touchdown pass and a 27-21 ML King lead after a failed extra point. “Jonquel made some heck of some throws tonight, the times we needed them, when were down”, Carson said about his senior quarterbacks overall effort tonight. And Dawson…who tied the state lead for 92 touchdown passes in a career on a night where he went for 343 yards 3TD 3INT on 17 of 33 via the air force..
“A great win, we overcame so much adversity it was just a great, a great win. Just believing in myself and the team that we can win, I just kept faith and always believe in my teammates that they can make plays and we made plays and we won it.” quarterback Jonquel Dawson said. And what about Blake Tibbs? “All night they bottled me up but when it came down to it my coach called on me to make a play, I had to make a play for my teammates at the end” Tibbs said. ML King defense was on the clock again, right there with Brookwood’s potent offensive run game in the overtime period. “Well our defense has played well all year long, a lotta folks don’t give them the credit that their jest due. They’ve played extremely well and we knew going into this game we had to stop [Brookwood’s] run game. Once they settled down (after ML King allowed an opening touchdown drive to Brookwood) there was no doubt in my mind that they would not be able to control their side of the ball” Carson said about his defense. In the end Brookwood quarterback Zach Mood missed on a fourth and ten pass on the Broncos overtime possession and the Lions advanced to the state quarterfinals. The ML King defense was stellar all night. Most notably in the third quarter when they held Brookwood to minus 14 yards of offense, zero first downs and had 3 sacks. “We were not going to give up, we put up in our minds that we were going to go out and fight to the death of us. We just played assignment football and played with discipline.” defensive end and linebacker Kenderius Whitehead on the defensive mindset the Lions came with tonight. Whitehead finished with a fumble recovery, 2 sacks and numerous tackles while junior Carlos Garrett was a beast as well with 2 sacks and several key defensive stops. Linebacker Toronto Thomas’ effective play must be noted as well. Jamaal Cole and Nick Tompkins each went for 70 plus yards rushing on 37 carries and three touchdowns against the King defense. Josh Stanford recorded 7 catches for 200 yards with 1TD and had vital receptions of 52 and 61 yards. Blake Tibbs had 4 catches for 60 yards and 1TD. ML King will face the Lassiter Trojans who were 20-17 winners over the McEachern Indians. ML King and Lassiter faced off over the summer at the University of Alabama in 7 on 7, now it’s time to add the linemen and the pressure of winning. Grayson 25 Lowndes 17; Robert Nkemdiche scored 3 rushing TDs and recorded his 13th sack of the season. Colquitt 17 North Gwinnett 7; Colquitt’s Willie Woodyard tallied 139 all-purpose yards and had a 75-yard TD reception on a little screen and added an 11-yard touchdown run. Many will point to North Gwinnett head coach Bob Sphire gambling gone a fourth and one on their own 29 yard line and being unsuccessful. That lead to Woodyard’s 11-yard touchdown and a Colquitt 14-7 lead in the second half. Buford 31 Jefferson County 0; Nathan Staub had a 90-yard TD run and Buford racked up 300+plus yards of rushing offense. Dontravious Wilson added 2TDs on the ground and Andre Johnson added a rushing TD. Gaffney,SC 33 Dorman (SC) 3; Gaffney quarterback Joey Copeland had 252 yards passing 2TDs 2INT and rushed for 2 TDS. Quinshad Davis had 106 yard receiving and 2TD for the Indians. Byrnes (SC) 56 Summerville,SC 20; Akia Booker caught 2TDs and Shakeem Wharton scored a rushing TD. North Marion (FL) 28 Fivay (FL) 0; Jamie Gilmore ran for touchdowns from 22, 1, 26 and 80 yards while becoming North Marion’s all time touchdown leader with 58. Gilmore had 15 totes for 163 yards on the night. The North Marion defense posted it’s third shutout in five weeks behind the play of Ben Poole and Jabari Bothwell, Latroy Pittman also recorded an interception. Pasco (FL) 21 Sante Fe (FL) 14; Pasco will travel to North Marion next week and won the last time the two teams met, 13-12 in the 2008 regional playoff final. First Coast (FL) 42 Forest (FL) 20; Mark Herndon had a 75-yard touchdown run and went over 100 yards rushing. NORCROSS, GA – The McEachern Lady Indians are trying to send a strong message. Although their 68-40 scrimmage win over defending 2A state champion Buford last Saturday will not count in the standings, it is on their resume. McEachern can now add another win over a defending champion to that resume. The Lady Indians defeated defending two-time defending 5A champion Norcross Blue Devils 55-43 for this first season win. Although it’s early in the season it should be noted that both wins came on the road, which is the truest test of any team especially when your playing a defending champion. McEachern outscored Norcross 35-19 in the second half after trailing 24-20 at the break. Norcross seemed to get the legs under them in the second quarter, after the McEachern’s physical defense gave them fits in the first quarter, behind all-world talent Diamond DeShields, who scored 10 of the Lady Blue Devils 14 points in the second quarter and had a sweet air reverse layup to end the half, while holding McEachern to only 5 points in the quarter. In third quarter the teams would go back and forth in the nip and tuck affair but McEacherns Dominique Wilson began to find her groove getting 6 of the Indians 12 points in the quarter while Norcross got solid play from Patrice Butler and Jasmine Kemp to close the quarter strong on a 9-2 run and a 35-32 lead heading to the fourth. That’s when the Lady Indians would truly flex their muscle. Trailing 40-38, Wilson dropped in a trey from just left of the key and came back with another trey to push the lead to 44-40. Then a Destinie Gibbs layup in transition and another bucket by Wilson pushed the lead count to 48-40 with 2:44 to play forcing a Norcross timeout. After the timeout freshmen sensation Tre’a Cooper hit a free throw,her only point, to extend the McEachern lead to 49-40 and the Lady Indians were on a 11-0 run, which would seal the game. “Defense won the game for us, period”, McEachern head coach Phyliss Arthur said afterwards. For McEachern Dominique Wilson would finish with a game high 24 points followed by teammate Pachi Roberts’ 19. Diamond DeShields led Norcross with 19 points. Norcross will face 3A power Columbia on Thursday and 4A state champ Fayette County on Saturday to conclude their annual Tip-off Classic. McEachern will return to action against Brookwood in the Cobb/Gwinnett Challenge before a trip to Memphis for Turkey Jam. 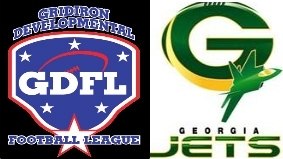 The Georgia Jets have confirmed they will competein the Gridiron Developmental Football League in 2012. Rumors had been floating about that the Jets would not compete in the GDFL in 2012 and were headed to another league. “Yes, we [Georgia Jets]will be playing in the GDFL in 2012”, Owner and CEO Rowan Reid stated firmly to Total Sports Coverage when asked about the status of the Jets. The Jets finished 8-2 in the GDFL in 2011, their first in the league and third overall, winning the Sun Belt Division and before losing in the first round of the playoffs to the South Georgia Noles (now the Sharks). GDFL Championship Game, Tara Stadium 10-1-2011 from Arthur Woodle on Vimeo.